The fury of the war for minesweeping personnel in Korea reached its apex during 1951. 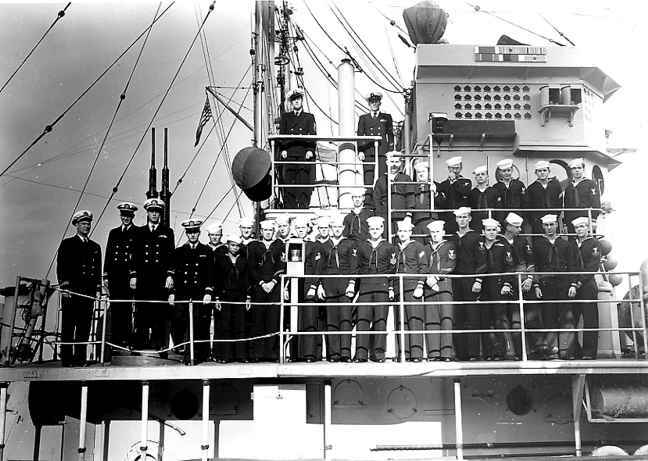 It was particularly risky for sailors aboard the wood hulled minesweepers of the AMS class ships. 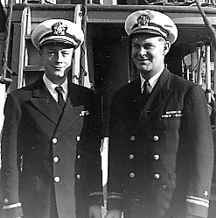 The AMS ships were really refurbished YMS type ships of the World War II era. (For instance, the USS HERON (AMS-18) had been YMS 369 during WWII, had been "mothballed," and then had been recommissioned as an AMS at the start of the Korean War). USS NEW JERSERY, and USS WISCONSIN and the 8-inch and 5-inch guns of their accompanying battle groups. (Only four U. S. battleships of the USS IOWA class were in commission at that time). Each of these surface warfare groups came, at different times to take up their positions and deal misery to the enemy. They took turns, meaning that at no time that I ever observed did more than one battleship group simultaneously occupy a firing station in a particular locale. wood hulled USS FIRECREST (AMS-10), USS WAXBILL (AMS 39), USS REDHEAD (AMS-34), and USS KITE (AMS-22). 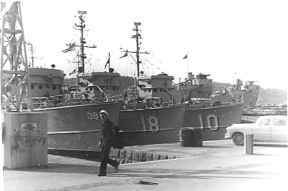 Steel hulled minesweeping types that we operated with included the USS REDSTART (AM-378), USS MURRELETE (AM-372), USS ENDICOTT (DMS-35), USS DOYLE (DMS-34), and several others. On one occasion we were sweeping close in to the inner harbor at Wonsan. Our sister ship, USS FIRECREST (AMS-10) was in the lead and we were second in a line of several ships. 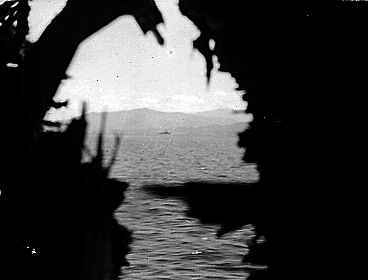 A ship and the mainland viewed through "the Hole"
personnel, the enemy shelling that hit the FIRECREST and the HERON came from Kalma Gak Point, a peninsular location just east of the city of Wonsan, North Korea. 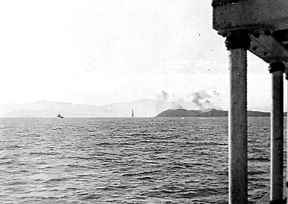 All the minesweepers in the line cut their cables to their minesweep gear, left all gear in the brink, and retreated, in previously swept waters, as fast as our engines could carry us. Only the FIRECREST and the HERON were hit that day. And both hits were above water line, which was a lucky blessing. Not a single person on either ship was injured: not even by a flying splinter. the galley, out the port side hull, and splashed some 50 yards away into the bay. 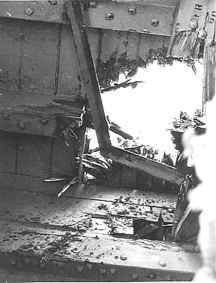 Later that morning, I could see clear through the bored hole that the big bullet had reamed. and down through the galley deck, through the crew's quarters and deck below, and into the ship's magazine. It landed harmlessly on the deck of the magazine compartment. In addition to my primary duty as engineering officer, one of my collateral assignments was damage control officer. The damage control party, using the port side Handy Billy (the one that was not destroyed) to hose down the explosion area to prevent the vessel from catching on fire. The whole event was fast paced and scary. immediately plastered by U.S. surface warfare ships and by rocket firings from carrier based aircraft. Our minesweep ships quickly made rendezvous with our tender, some 5 or 6 miles out near the mouth of the bay. I believe that our tender ship at that time was the USS COMSTOCK (LSD-19). Anyway, shipfitters from the tender applied patches over the shell damages, caulked, painted over the patched areas, and within an hour or so we were back streaming new minesweep gear and going about our regular routine. 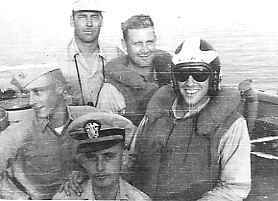 This picture, taken in late 1951 on the open bridge of USS Heron. 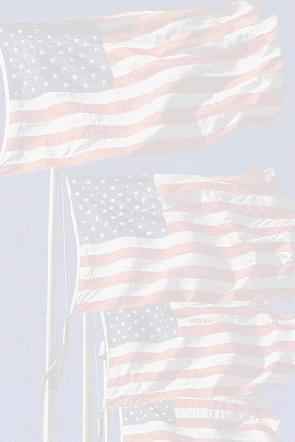 sinkings included two, steel hulled, AM's, [the USS PIRATE and the USS PLEDGE] with heavy loss of the lives of a majority of their crews. 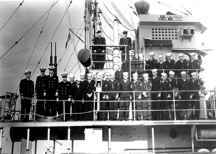 One of our sister AMS's, the USS PARTRIDGE, was also sunk and, as I recall, almost all personnel aboard were lost. I believe that only 4 or 5 people survived the PARTRIDGE's sinking. We lost four minesweepers that year. I believe I recall that the fourth vessel that was lost was also an AMS, the USS MOCKING BIRD. 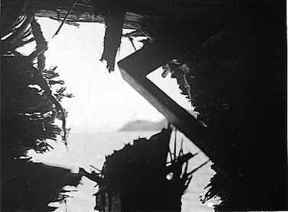 Considering the frequency and intensity of shelling by shore battteries during the entire year of 1951, we were fortunate, indeed, to incur so few hits from North Korean shore gunners.